Waupaca County vital records can be requested by mail from the Register of Deeds in Waupaca, with divorce records from the Clerk of Court. Uncertified copies are public records. Records from October 1907 to the present can be ordered for $20 by mail, fax, or in person from the Wisconsin Department of Health Vital Records Office in Madison, and online through VitalChek. 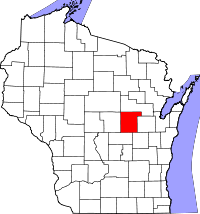 Pre-1907 historical records, dating from the county's settlement and founding in 1851 out of Brown and Winnebago Counties, include marriages to 1846, deaths to 1848, and births to 1858. These records, although incomplete, are available from the Wisconsin Historical Society, with a statewide index online.